IPOH, Malaysia — Former students of the century-old Ipoh’s Methodist Girls’ School (MGS), Malaysia, are up in arms over the planned felling of an iconic rain tree on its grounds. To the alumni, the tree that is estimated to be over 100 years old was a physical symbol of the institution’s growth over the generations. 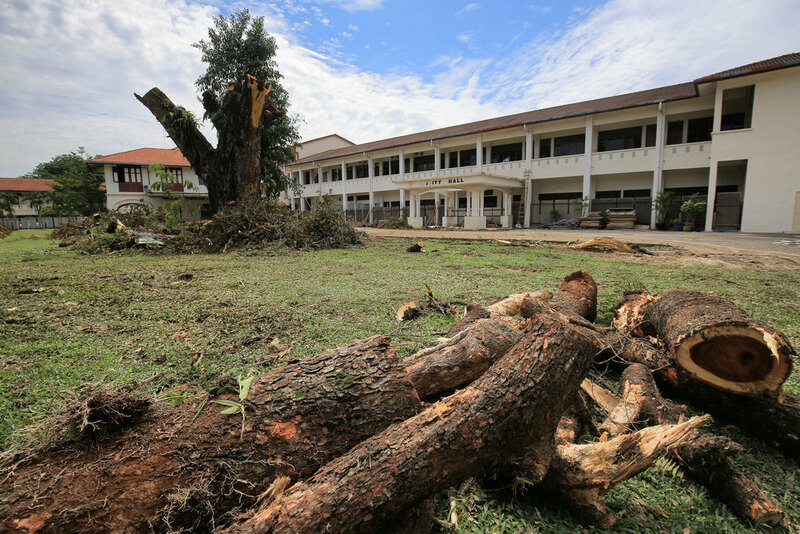 MGS Old Girls’ Association vice-president Linda Hanim Mustaffa said the association had not been informed of the school’s plans to fell the tree, which is believed to have started sometime over the weekend. “Before the branches were chopped down, the tree’s crown was huge. It provided shade for so many students and it became the main assembling point for us. “We used to have gatherings, play softball, and hold band practices under the tree. It is incredibly meaningful to all of us,” Linda told Malay Mail here today. Linda said she only found out when pictures of the tree’s chopped branches began circulating online. The exact reason for the felling of the tree is unclear. She said the felling needed to be stopped for sentimental, legal and environmental reasons. “From an environmental perspective, the tree is still solid. We don’t know why it needs to be felled and who knows if it will be able to grow to the way it was again,” she added. The movement protesting the felling of the tree has gained steam online with a petition on the change.org platform collecting over 2,500 signatures as of 3.30pm today. Fellow alumna Lee Pooi Mun, who is leading the legal team fighting the felling of the tree, said the tree could not be felled without approval from the local planning authorities — namely the Ipoh city council. Under Section 35H of the Town and Country Planning Act, no person is allowed to fell a tree with a girth exceeding 0.8m without the written permission of the local planning authority —unless the felling involves a dead or dying tree; is to prevent an imminent danger; or to comply with any written law. Lee said she had also written a letter to the school demanding that the felling works be halted immediately, and the tree be allowed to regrow undisturbed. “The rain tree is synonymous with our school. When we celebrated our 120th anniversary last year, we actually had a replica of the tree and we posed with it. That’s how much it means to us,” she said. Attempts to contact the school’s board of governors and the city council for a response were unsuccessful.